Some supporters of Israel think she isn’t deferential enough toward Israel. Conservatives think she’s liberally biased. ABC News insiders are unhappy that an outsider got the This Week job. There’s not much meat here. Insiders are always unhappy when an outsider gets a plum job. There are ideologues with an axe to grind against everyone. And perhaps This Week could do with a little more substance and a little less “inside-the-Beltway palaver”? Anyway, strange stuff. 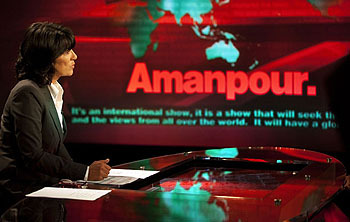 I don’t know if I would have picked Amanpour either, but if I were arguing against it I’d at least try to come up with some colorable criticisms. This is just junior high school stuff.